Parishioner Pat McCarthy put an anniversary quilt on a table. 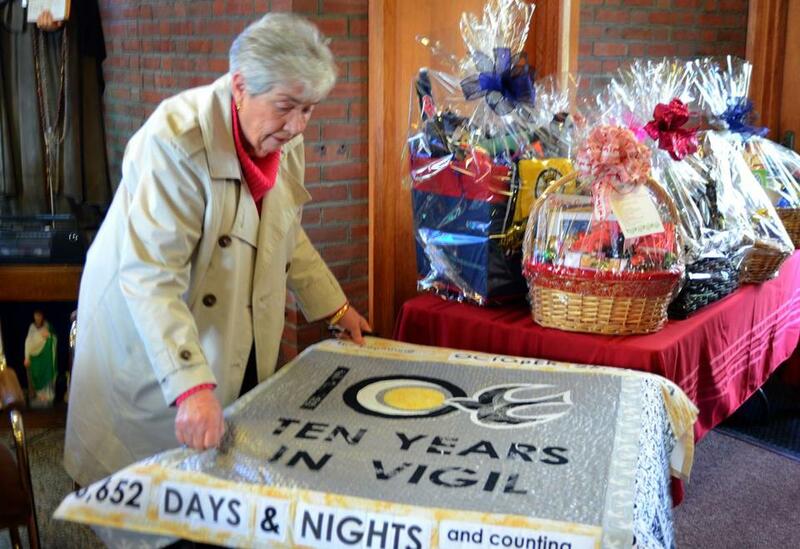 SCITUATE — Parishioners at St. Frances Xavier Cabrini Church in Scituate on Sunday marked their 10th year of holding a round-the-clock vigil while refusing to vacate their closed Catholic church. “It’s been a joyous burden,” said Maryellen Rogers, 50, who has spearheaded the vigil with her husband, Jon Rogers, 55. “This is a strong, faith-filled community,” she said. The parish received a letter of intent to close from Cardinal Sean P. O’Malley in May 2004. Five months later, when the locks on the church were changed, one parishioner entered through an unlocked side door. Not one day has passed since then without a parishioner holding vigil inside the building. 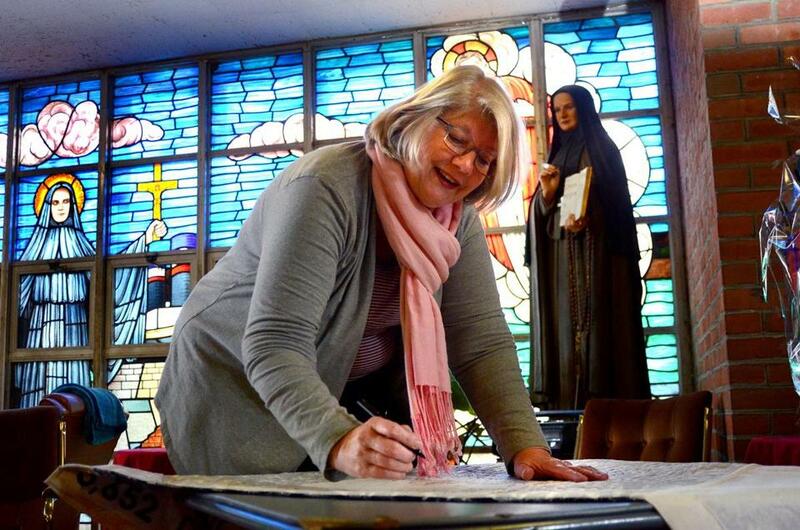 They call themselves the Friends of St. Frances, a nonprofit that has maintained the church and grounds through fund-raising efforts for the past decade. Donilon said previously that St. Frances was closed in part for financial reasons, falling attendance, a shortage of priests, changing demographics, and the presence of other Catholic churches nearby. Parishioner Peg O'Brien signs the 10th anniversary quilt. Many of those who stand vigil in the church attended the anniversary observance, which took place following the regular 10 a.m. Sunday lay service. Past an entryway filled with food-covered tables and pamphlets for the upcoming “Evening Under the Stars” fund-raiser, the walls of the church are draped in quilts, each made to commemorate one of the vigils. Before the congregation, Jon Rogers thanked the “crazy people who have slept here without heat week after week,” calling them the heroes of their church. Sean, Scott, and Christian Arnold are 16-year-old triplets who have spent every Friday night in the church for 10 years. They stay in one of two bedrooms off the side of the main hall, with beds covered in colorful blankets. The three teens said they have formed strong bonds with other parishioners. “We’ve grown up with these people, and they’ve taught us a lot,” Sean said, as he and his brothers reminisced about chess, choir practices, and family nights at the church. 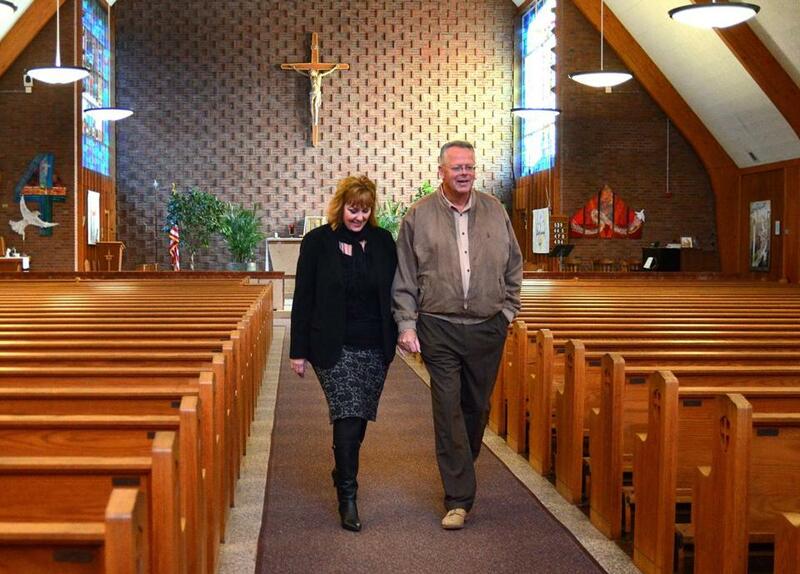 The church was built in November 1961, just four years after Margy O’Brien moved to Scituate. O’Brien, 84, has been an active member of the parish since its founding, especially over the past decade. “In these 10 years, it created a strong family — caring, loving, crazy,” O’Brien said. The Rogerses and other constituent members have asked the Boston Archdiocese to either reinstate the church as a fully functioning parish or sell them the church. “Our first hope and prayer is to be back with the archdiocese,” Maryellen Rogers said. After a number of appeals to prevent St. Frances’ closing and resale, the Catholic church’s highest court — the Apostolic Signatura — denied the parishioners’ final appeal. Many of the parishioners said they remain stalwart, comfortable in their church and their community, though the threat of arrest hangs over them. “We were naive enough to believe that we could make changes within the archdiocese, that our voices would matter,” Jon Rogers said, standing before one of the colorful vigil quilts. “We found out that we were wrong,” he said. Maryellen and Jon Rogers walked through the church.